Explore the many attractions this city has to offer. The backstreets around Durbar Square and Palace are bustling with life with throngs of people going about their lives and selling on the road. Random cows wander the streets, taxis hoot and narrow alleyways overflow with spices, vegetables and handicraft shops with intriguing and unpleasant smells, incessant noise and pollution – triggering a sensory overload. You could also venture to ominously named freak street or Jochne named by the hippies during the 1970s. 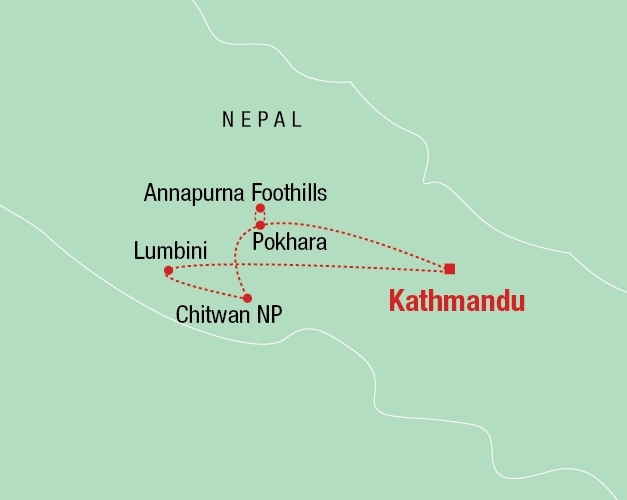 Today we travel down the dusty roads to Lumbini which lies in the foothills of the Himalayas in Nepal. Lumbini is said to be the place where Gautama Buddha ‚the apostle of peace and the light of Asia‘ was born in 623 B.C. The most important temple at Lumbini is the Maya Devi Temple, marking the traditional site of the Buddha’s birth. The temple stands on the site of earlier temples and has been a place of pilgrimage for hundreds of years. 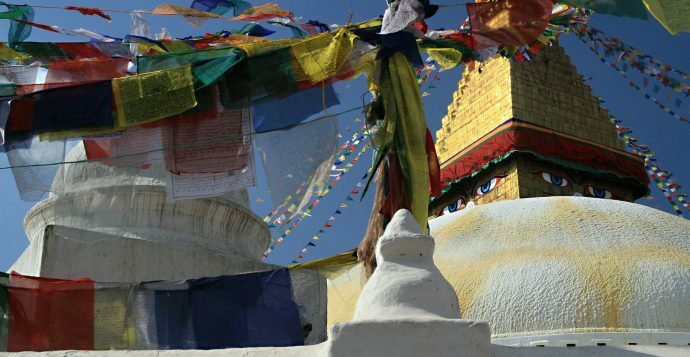 The area around Lumbini is entirely Hindu, but many Buddhist temples and shrines from various nations are scattered around the holy site itself. We travel to Chitwan National Park. The park is UNESCO World Heritage listed (1984) and is home to one of the last populations of single-horned Asiatic rhinoceros and also of the Bengal tiger. The park is situated in south central Nepal, covering 932 square kilometres in the subtropical lowlands of the inner Terai. The area comprises the Tikauli forest – from Rapti river to the foothills of the Mahabharat – extending over an area of 175 square kilometres. The area became the country’s first National Park in 1973. We return to Kathmandu for a final night in Nepal’s capital. Enjoy some last minute sightseeing and souvenir shopping or a final dahl baat with your tour group. Diese Tour startet mehrmals im Monat und beinhaltet 8 Übernachtungen in Hotels und 2 Übernachtungen in Lodges.